Description: Sonatas in the Italian style by the main German violinist of his time (and for whom so many famous composers of the day wrote pieces). 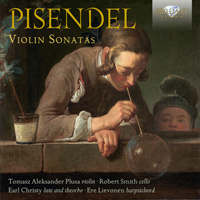 Pisendel's own fiendish unaccompanied sonata served as a model to Bach. Tomasz Aleksander Plusa (violin), Robert Smith (cello), Earl Christy (lute, theorbo), Ere Lievonen (harpsichord).